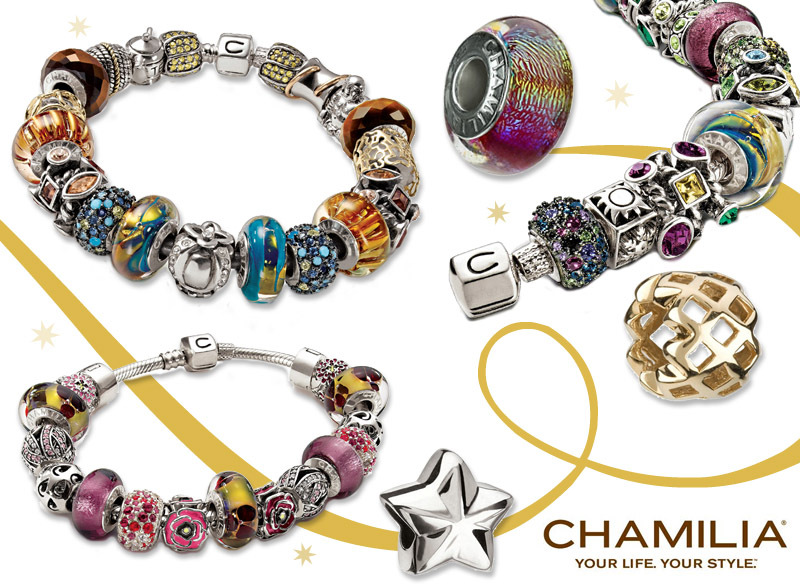 Have you seen our huge collection of Chamilia, here at Jewelry Warehouse? Chamilia pieces are a great way to remember a memory, a certain special day, or event in your life, or the give to a loved one! Share a bead with a special family member, and they will cherish it forever! The beads come in Sterling Silver, 14k Gold, Italian Murano Glass, with accents such as Swarovski Crystals, Mother of Pearl, Cubic Zirconia, Pearls, Enamel, Art Glass, and Stones. Not only does Chamilia, make beautiful beads to wear, they also have the “Give Back” program, which supports causes and organizations! About the “Give Back” Collection ~ The Give Back Collection by Chamilia features beads designed in support of causes that matter to you – and to us. By purchasing beads from this collection, you not only support causes you care about, but also give back to various charities that value your much-needed assistance. For each bead bought from this collection, a portion of all proceeds is donated to an organization chosen by Chamilia. To date, this has allowed many organizations make a difference in the lives of individuals, families, and children in need. In the past, Chamilia and its Give Back Program have supported charities focusing on breast cancer awareness, autism, world peace, and other children’s charity programs. This year, Chamilia is donating a percentage of all proceeds from the Give Back Program to the charity, Be the Match. This organization based in Minnesota in the US is dedicated to raising funds and matching donors with leukemia, lymphoma, and sickle cell patients who need a transplant. As most of these organizations are non-profit and thrive entirely on donations, you’re invited to make purchases that are equal parts socially conscious and chic! Just like you, we believe in the concept that giving back is always in style. Information from Chamilia ~ Chamilia jewelry is designed with today’s fashion-forward woman in mind. Our innovative yet practical designs are created to reflect your life and your style. Since 2002, our expertly-designed jewelry has been created from only the finest materials, including 14 carat gold, .925 sterling silver, SWAROVSKI ELEMENTS, handmade Italian Murano glass, as well as natural and colored quality gemstones. Every season, Chamilia introduces fresh, new collections made from these exquisite materials that continue to expand the brand’s range of styles and colors. However, year after year, the distinct quality of Chamilia remains the same, as does our goal: to pay tribute to the designer within every woman. Thus, our collection of bracelets, earrings, necklaces, and premium beads and locks promotes the celebration and expression of fashion and individuality. We want women around the world to show their uniqueness by telling their own story through their personalized Chamilia jewelry – and by wearing it proudly. This entry was posted in Jewelry, Jewelry Brands and tagged beads, chamilia, Jewelry, jewelry warehouse. Bookmark the permalink.